Happy seasonal greetings to you! If you are on holiday (or have been on holiday recently) then I hope you’ve had an excellent time. We have had a pretty gorgeous Christmas season visiting various family members before coming back to our own little hideaway, and right now I’m savouring the last few days off before reality crashes back in next week. It seems an appropriate time to show you the single knitted gift that I gave this year. 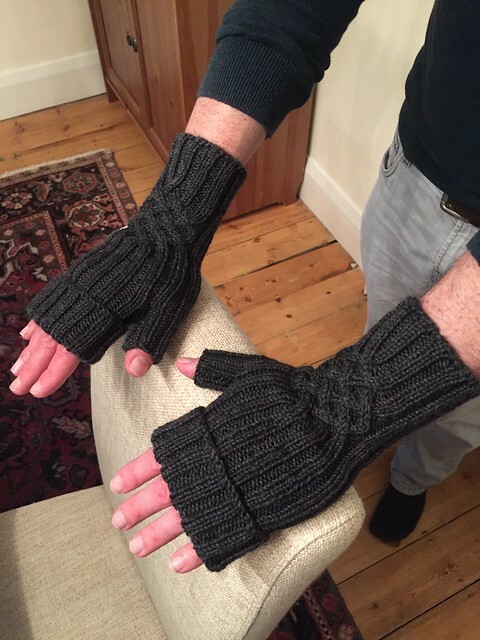 These are some bespoke gloves that I made for my dad, which were actually a request from my mum after she saw me making my Inglis Mitts a couple of months ago. My dad has advanced Alzheimer’s*, which now manifests itself physically as well as mentally. One of the things he experiences is very little manual control of his hands – and for my mum, who’ll kit him out with gloves when she takes him out, this poses a challenge. 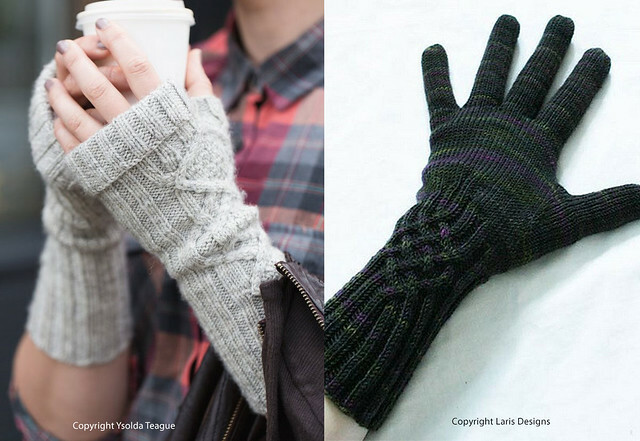 She saw my nice stretchy fingerless Inglis’s and asked if I could do something similar for Dad (and of course I could). I wanted to do something a bit different though – the Inglis’s are too long and the cable isn’t very my-dad. 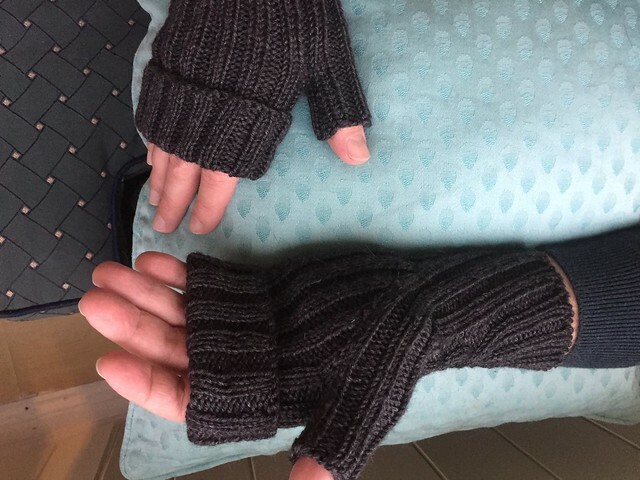 So after a little bit of pondering I hit upon bringing in the glorious cable that features in Julia Mueller’s Knotty Gloves pattern (which I’ve knit for myself before and owe you a blog post about). I’m super-pleased with them. They’re knit in a robust DK yarn which should cope nicely with the hard wearing that Dad will give them (in fact, it’s a much more practical yarn than the one I chose for mine – it gives good crisp stitch definition and was very good to knit with, which just goes to show I should be a bit less snobby about yarn a bit more often). And they still have that satisfying Inglis shaping on the palm for the thumb. 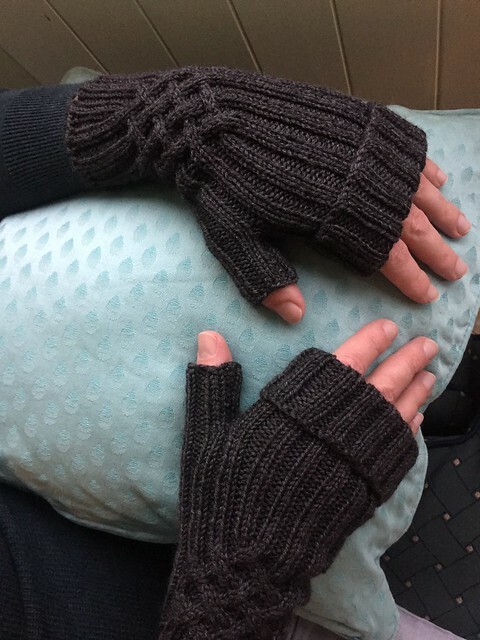 The other changes I made were to knit them with a cuff rather than being full arm-warmers, making the ribbed portion over the fingers and thumb a bit longer overall, and knitting a row of purl stitches at the ‘bend’ point so that the roll-over section flips back nicely. Oh, and I made the cables a mirror of each other – a tiny detail that only I will ever notice, but which will please me when I remember. The model for these pictures is my patient husband, but we tried them out on Dad over Christmas and they fit him perfectly. And Mum declared them a success which is the ultimate praise. Hooray! 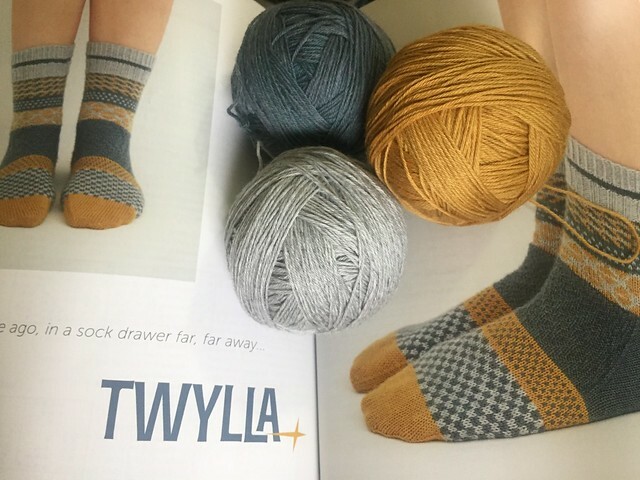 Christmas has otherwise naturally featured a bunch of me-knitting – a pair of Linnea socks have been finished and I’m pretty close to completing the first sock of a pair of Twyllas (after a false start which necessitated re-knitting half a sock – ugh). Some of this yarn is now almost-a-sock. Magic! My friends and family proved they know me excellently well by getting me several knit-based gifts. Oh! And I went to the Pom Pom Christmas party with my knit gals (and one guy), which was just as much fun as last year. All-in-all, I’m a lucky lady. And this morning we braved a trip to IKEA to tick off one of the things I have been craving for, ooh, about 12 years – proper storage for my stash! Watch this space. * This isn’t a blog about Alzheimer’s, but if you have found your way here as the result of a search about the same because it’s affecting you or a loved one then you have my deepest sympathies – much love to you.